Adding photos and videos to texts is done through a new interface. After tapping the Camera avatar, the keyboard is replaced with a live preview from the camera, along with the option to switch from the rear iSight view to the front-facing FaceTime view. If Photo library access is needed, recent photos are shown next to the live camera preview, and a swipe lets you navigate through your photos. Swiping the opposite way brings up two buttons: Camera and Photo Library. Selecting either option uses the entire display to capture photos/videos or browse your collection, respectively, instead of just the smaller section usually reserved for the keyboard. The biggest change is Messages' newfound support for third-party applications, which can range in complexity from simple (like adding stickers) to more complex (like hailing a ride, booking a reservation or sending money to a friend). By opening Messages up to developers, Apple has created a mini platform within iOS that developers can build on. If the concept works half as well as it should, there will come a time when we won't have to leave the Messages app to perform most immediate functions. That's an exciting advance users will appreciate. There are a few less dramatic, but still noteworthy additions. Messages inherits iOS 10's system-wide keyboard improvements, including switching languages on the fly (complete with word suggestions and spelling corrections). To use multiple languages, just keep typing and the iPhone figures it out. Messages also lets you jump to a user's contact information just by tapping the person's avatar near the top of the display, and you can activate read receipts on a per-person basis. Taken all together, the changes to Messages make it much more than the simple texting app users expect. And future third-party tweaks should make it even more robust. Maps: Are we there yet? A few years removed from the controversy that marred its debut, Maps has evolved into a useful app close to par with its Google counterpart. Much work has been done on the back end to improve database listings and directions. 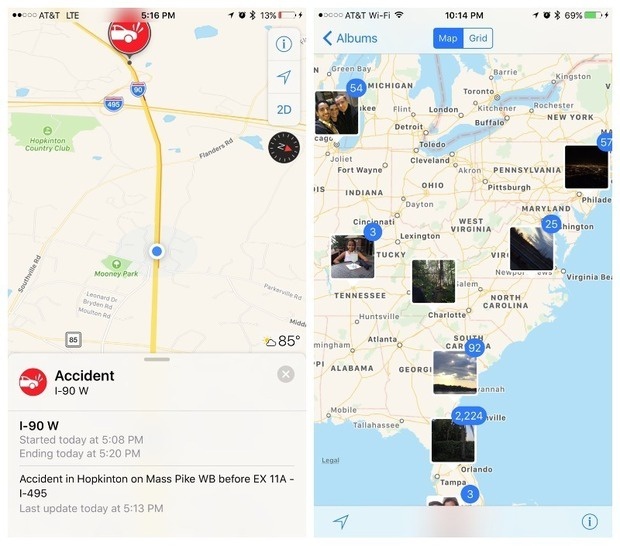 In iOS 10, Maps now hosts an assortment of interface updates that make it easier to glance at data as well as workflow enhancements that help you find destinations faster. When Maps is launched, the lower two-thirds of the iPhone's display shows a search field and proactive suggestions; this makes it a little easier to get started, especially if you tend to use the iPhone with one hand. Maps features larger text throughout, and the overall design feels less cluttered. The main Maps view has an Information button at the top right, which includes options to toggle between different views (vector maps, satellite, and transit), add traffic overlays, mark locations and report issues. Below the options button is an arrow icon; tapping it once finds and tracks your location, tapping twice enables the compass, and tapping a third time resets location tracking and compass to off. Current temperature and weather conditions are at the bottom right of the main Maps view, and below that is a text input field for searching places and addresses. Underneath the text field is a list of potential places of interest, dynamically updated based on recent activity. This list includes a record of where your car is parked and how to get back to it, recent or upcoming destinations, and marked locations. There are also shortcuts to local destinations such as Food, Drinks, Shopping, Services, Health, Transportation and Travel options. The main interface isn't the only area to receive an overhaul. The Guided Navigation mode has been updated too, and there are now visual indicators of traffic and congestion, as well as the ability to pan and zoom; neither was present in Guided view in earlier versions of Maps. To help you navigate to your destination, Maps dynamically adjusts the view when in Guided mode, based on the next step you're supposed to take. If the next step is some distance away, Maps displays a more distant view of the road; when a turn is forthcoming, Maps zooms in closer to provide more detail. Maps also allows you to search for destinations along the guided route, automatically adjusting the arrival time based on added places of interest. Maps is now smart enough to be aware of upcoming appointments, updating the main list and accompanying widget as a potential option. As with Messages, Apple has opened up portions of Maps to third-party developers, enabling the app to do more than originally designed. Maps, for instance, can help you book a ride with Lyft, Uber and other services, and make reservations in restaurants. Once developers get their hands on this, I expect much more. Left: Maps features larger text and access to info such as traffic. Right: The new Places view shows you where your photos were taken. There are two major additions to Photos that are easy to spot: new smart albums (one called People and another called Places) and a new tab called Memories. Those features alone are significant, but what you can't see in Photos is just as important: Each photo is processed for location data and run through algorithms (using what Apple officials call Advanced Computer Vision) for facial as well as object and scene recognition. Even better, Photos now supports Siri searches based on location, person and even elements of the shot. The new Places view is located in the Albums section of the Photos app. Tapping that album calls up a map with overlays of photo clusters based on GPS information embedded in the pictures. Zooming in and out of the map displays more or less photo clusters, respectively. It's a great way to visually track where you've traveled, as well as quickly find photos taken at specific locations. If the Maps view isn't enough, there is also a Grid toggle, which sorts photos in a list based on date and location. There is also a smart album called People, which does exactly what you'd expect: It sorts your photos by people. But it requires an initial setup before it can be used. First, every photo has to be scanned -- for that, Photos requires that your iPhone (or iPad) be plugged in and left alone. Essentially, if you leave your device plugged in overnight, by the time you wake up, the People photos folder should be ready to view. But here's where things break down a bit: Photos of individuals are consolidated, but Photos itself isn't always accurate. Some photo clusters need to be manually merged, and then you have to manually name the photo cluster. Photos makes it easy to do so by providing suggestions from Contacts as you type, but this has to be done with every person Photos has identified. It's a very tedious process. And there isn't a way to tag people in photos in which faces are blurred or obscured if the photo recognition doesn't pick up the face. Once finished, the People view is a great way to find individual photos of friends; just make sure to check every once in a while to tag new photos with faces that haven't been matched. The last major Photos feature is the Memories tab. I mentioned that Photos scans every picture and processes them using Apple's algorithms, which sorts photos based on locations, people, and the date of events. The Memories tab is a place where all of that data is used to cluster related photos into dynamically created albums. In Memories, you'll find albums based on topics such as Last Weekend, Best of the Last Two Weeks, and many other criteria like locations and events. Tapping these memory clusters displays appropriate photos and videos, but also creates a movie consisting of photos and videos of an event, including footage gathered from Live Photos. The movies can be edited in simple ways: you can change themes and music; alter the duration; swap out media selections; and edit video clips to show the specific few seconds you really want. The new Photos movie-making feature isn't exactly iMovie lite, but it does allow non-videophiles to get in on the video-making action. One missing feature: Apple currently doesn't allow users to export these Photos-built movies to iMovie for fine-grained editing. This would be a good feature to add: It would provide a great starting point for people who want to edit videos, but don't really know where to start. That said, the movies generated by Memories are pretty good, and do the job of taking photos and movies that might otherwise be forgotten and packaging them in an entertaining and share-worthy way. There were many times during testing that I used Memories and realized I had forgotten about a particular picture or a specific moment and found myself grinning, caught up in the movie Photos generated. So, for that, Memories is a great addition. Photos in macOS Sierra, due out next week, and the new AppleTV system software have also been revamped to reflect these new additions. The Music app has been reengineered in iOS 10 with an emphasis, not surprisingly, on Apple's music service. If you're not subscribed to Apple Music, you'll be mostly limited to the Library tab, which has been redesigned to separate music found online (such as via iTunes Match) and songs actually on your device, under the Downloaded Music heading. I wish there were a way to jump to the Downloaded Music view each time the Music app opens, but that's not possible. So accessing my downloaded songs always requires a few taps. For Apple Music users, the submenus "For You," "Radio," "Search" and "Browse" make it easier to explore music you may not have heard before. Browse, for instance, gives you curated lists of the latest and greatest songs in a variety of genres, as well as collections of playlists to explore. The For You section includes playlists and albums based on songs you've marked as Love (via tapping a Heart icon). Overall, the Music app is a little less cluttered than before, and a little easier to navigate. The only major problem is that without an Apple Music subscription, most features aren't accessible. For instance, under the For You section, songs are viewable, but any attempt to play them without an Apple Music plan simply calls up the option to sign up or cancel. That's both a wasted opportunity to sell a song via the iTunes Store as well as a waste of screen space for people not in the Apple Music Service fold. Apple has attempted to make the Music app a little more intuitive. Did it work? I can't say -- I don't subscribe to Apple's Music Service so I don't have access to all the features. There are many more improvements to iOS 10. 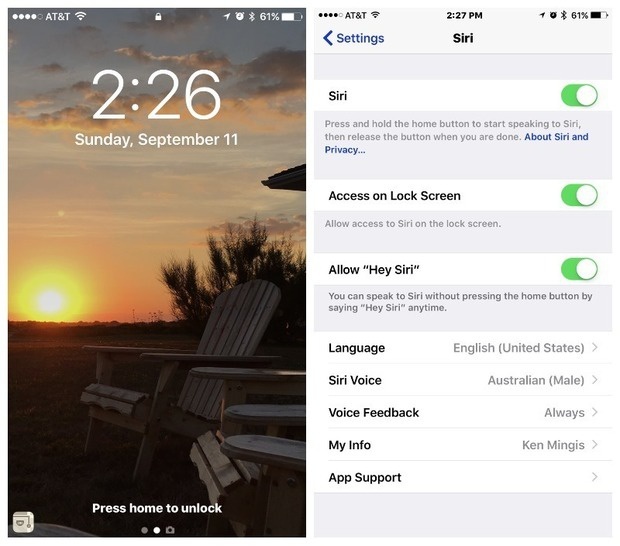 They include small tweaks like the new pop-up option to share highlighted text, which makes it easy to post that text in social media; changes to HomeKit, which should help consolidate different home automation devices under a single interface featuring Siri support; a new voicemail transcription feature which shows text so you know what you're getting into before listening to a voicemail; and an improved system keyboard with smarter in-context suggestions such as current location, contact information, recent addresses and multilingual typing. There's improved device integration with other Apple products using Continuity technologies such as Handoff, AirDrop, AirPlay and text message forwarding. iOS 10 offers a couple of tricks along these lines: It's possible to view your documents and desktop items from other Macs in iCloud Drive; and -- even handier -- Cut/Copy/Paste works amongst all your Apple devices. This means you can copy a link or photo from the iPhone and paste that snippet into a document on the Mac. Control Center is improved, with three distinct sections to swipe through: System controls, Media controls, and HomeKit controls. And for iPad users who take their web browsing seriously, time to rejoice: You can now have two Safari windows open at once in Split Screen view. Just drag a link to the right side of the screen and the site will open in a new window. 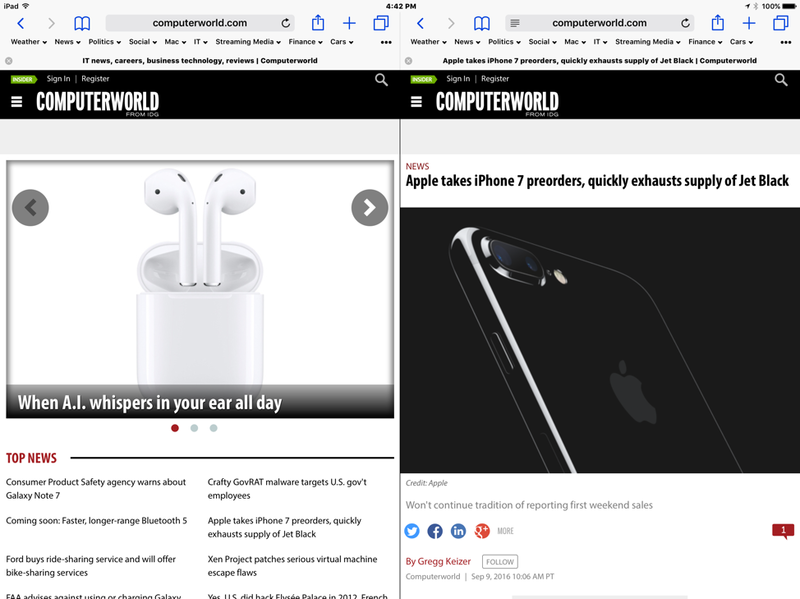 You can now have two Safari windows open at once in Split Screen view. Overall, iOS 10 is a fast operating system that continues to build on a foundation that it set with the first iPhone OS nine-plus years ago -- and it offers stability that wasn't present in the initial versions of iOS 7 and 8. The many new features in iOS 10, both big and small, add up to not just a better user experience, but to a smarter one as well. Rather than a collection of software pieces, iOS 10 feels polished and coherent in helping mobile users do more and do it quickly. And by opening up parts of the OS and Apple's own apps to third-party developers, Apple has ensured that iOS 10's usefulness will only grow. Simply put: iOS 10 is a highly recommended upgrade. Get it and start enjoying.